Xiaomi is slated to launch its Mi Play smartphone today in China. The smartphone was recently spotted on the Chinese certification website, TENAA. However, the variants listed on TENAA were contradicted by a new report. Now, ahead of the official launch, Xiaomi President Lin Bin has taken to Weibo to share some official renders of the upcoming gaming smartphone. Moreover, the Mi Play price has been revealed via a leaked image. Xiaomi Mi Play price is RMB 1,699 (roughly Rs 17,300), according to the leaked image. The image is accompanied by a list of specifications of the handset, including the 5.84-inch display with waterdrop notch, 3,000mAh battery, 2.3GHz MediaTek SoC, 6GB of RAM, and 64GB and 128GB storage options. Dual camera setup with AI integration on the back is also part of the package. Moving on to the images, a previous leak had suggested that the Xiaomi Mi Play will be offered in three hues – Black, Dream Blue and Dawn Gold. The new official images reveal that the Black variant of the Mi Play will feature solid hue. The Dream Blue and Dawn Gold, on the other hand, will feature an attractive gradient finish that reflect different hues when light bounces off it. The new images also show a dual camera setup with LED flash in vertical alignment in the top left corner on the back. The rear panel is also seen housing the circular fingerprint scanner in the centre. Another image reveals that the Mi Play will not ditch the 3.5mm audio jack, which can be seen on the top edge of the phone. Earlier leaks have revealed that the Xiaomi Mi Play will come with a 5.84-inch display with support for full HD+ screen resolution. While the name of processor is not known at the moment, it’s revealed that the smartphone will be powered by a 2.3GHz octa-core processor. The dual camera setup on the rear panel is tipped to be housing a a 12-megapixel primary sensor with no information regarding the secondary shooter. The display notch is said to be housing an 8-megapixel shooter. The smartphone is rumoured to be offered in three variants – 4GB RAM + 64GB storage, 6GB RAM + 64GB storage and 6GB RAM + 128GB storage. As of now, this is all that is known about the upcoming smartphone. 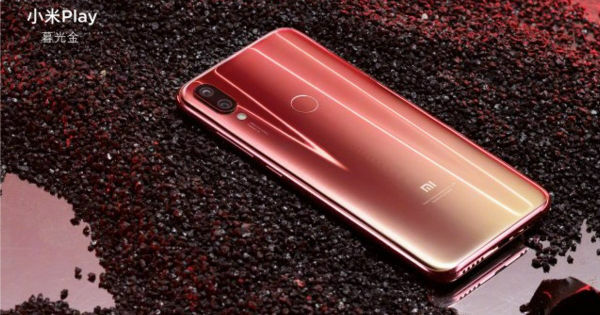 If the rumours are to be believed, the Xiaomi Mi Play is likely to be launched in other markets as Xiaomi Redmi 7 Pro. We will bring you more updates on the smartphone including pricing and availability when it goes official later today, so stay tuned.